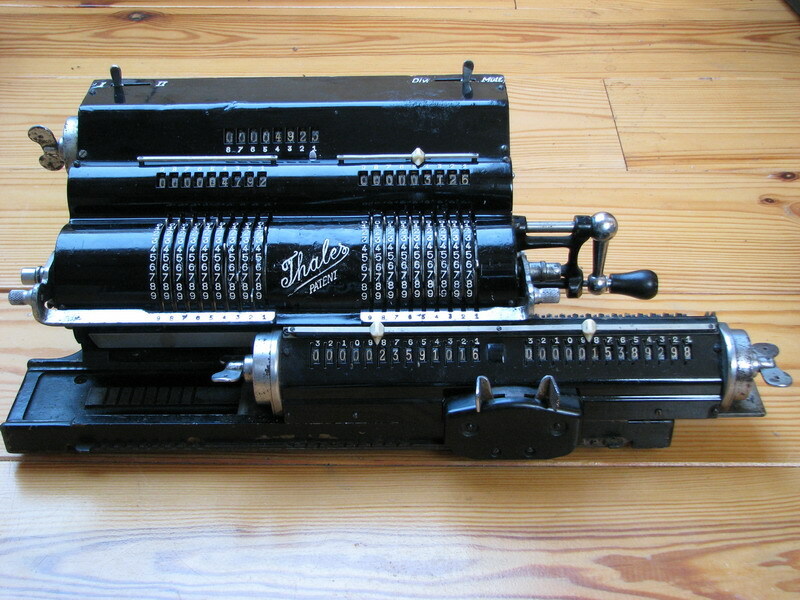 This is the only calculating machine that has ever hurt me, but I have decided not to have it put down after all - I did end up selling it though. I acquired this Thales GEO in really very sorry condition, with lots of damage to the plastic, missing comma sliders, and a dent to the cover plate right in the middle of the Thales logo. It actually looked as if someone had dropped the machine on a concrete curb from a fair height. The cover was scraped from the inside by the pinwheel cylinder, there was also a lot of rust, and flaking of the paint. I decided that the only way to save the machine would be to repaint the top cover. Sadly, my automotive bodywork skills were non-existent at that time, and if I would have to do it again right now, I am sure it would look a bit better. The dent was removed as well as possible, and the smashed "Thales" logo was carefully redone with a Dremel rotary tool and a tiny engraving cutter. Once the cover was painted and the repaired logo filled with white paint, it looks surprisingly decent! 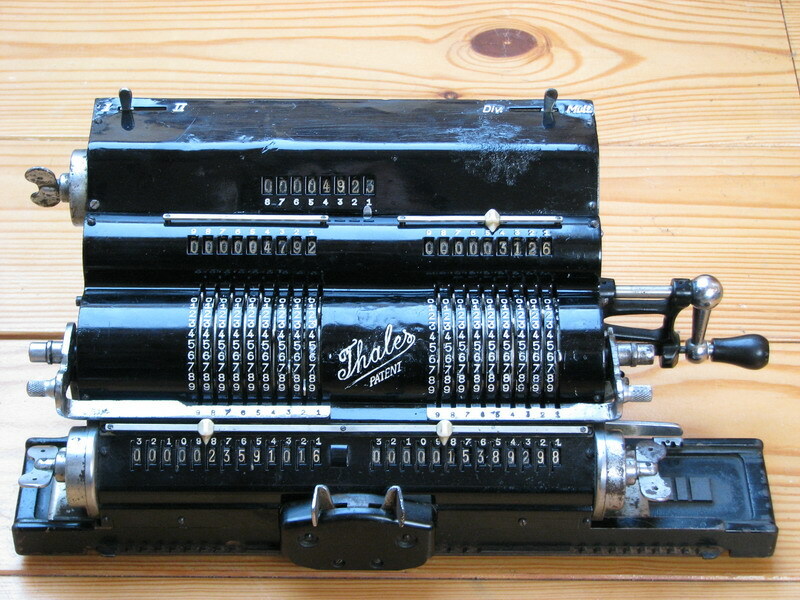 You can still see that in the right input register the numbers don't quite line up horizontally. Mechanically, too, a few things were amiss - the cast iron support between the two pinwheel cylinders had broken off, so this was repaired with grey epoxy with strips of metal to reinforce it. In light use, so far it has held. Everything else was roughly cleaned, then adjusted where necessary (the input control register and the associated safeties kept sticking and jamming), and lubricated. 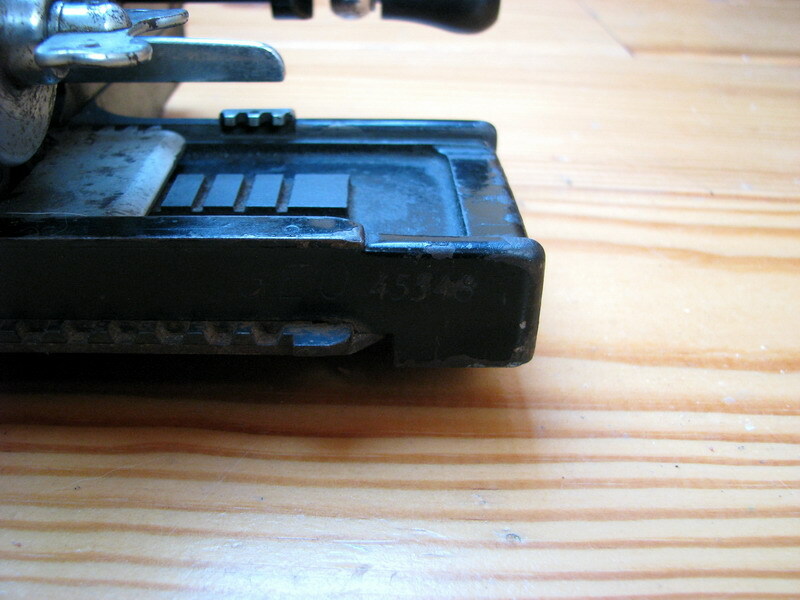 Finally, as a finishing touch, I also laid in waiting for a cheap, junk, blocked and rusted parts machine off ebay to replace the broken black plastic cover on the carriage lock. This endeavour met with success, but it took a few months. Things at this point were looking up... did I know much! In putting everything back together (crucially, with this black plastic carriage lock cover still off), as usual, one needs a third hand to accomplish all the necessary wiggling, pushing and pulling, and I was busy trying to push, hold and shift everything that needed to be pushed, held and shifted to get the carriage back into the machine, when suddenly the hook-shaped end of one of the two tiny springs that are inside the carriage lock, cut through the skin on my index finger and hooked itself inside. Of course this happened at a point where the carriage itself was already quite solidly sitting on its rails. So there I was, with a -what ? 15 kg ?- calculator hanging from my right index finger by a tiny wire spring. Ouch! Apart from "Ouch!" I probably yelled some more choice expressions which are not quite suitable for reproduction here, but the lucky result was that my girlfriend came running to see what was happening - which was good, because to resolve the situation, I needed a tiny screwdriver that I couldn't reach from where the machine was keeping me hostage. 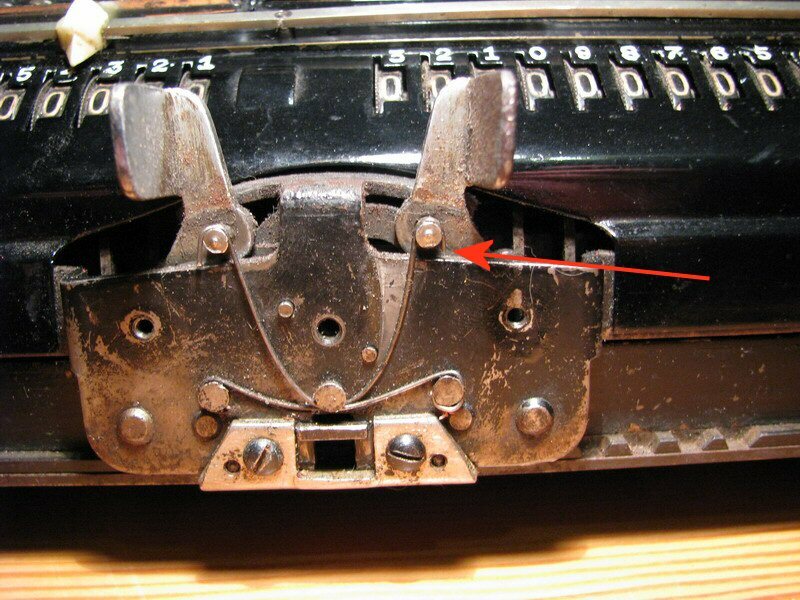 As shown in the image above, the spring is held onto the carriage by looped ends around mushroom shaped posts on the front of the carriage shift mechanism. If you can get a small screwdriver under the end of the spring, it simply comes off, thus at least freeing me from the obligation to lug around the entire calculator to wherever I wanted to go, and allowing me to sit down. We then considered what to do - removing the spring would not be easy due to its shape. We thought for a minute that we would have to drive to the emergency room (obviously, this sort of thing always happens late at night on a Saturday) and let them figure out how to get it out, especially since I hadn't been paying too much attention to the shape of the spring prior to it getting stuck into my finger, so I didn't quite know in what direction to twist in order to get it out. However, there are actually two of these springs in the machine, so by undoing its mirror image on the other side of the carriage lock and comparing it with what was sticking out of my finger, I was able to get it out relatively painlessly by some judicious wriggling, twisting and pulling - much like putting a carriage back into a disassembled pinwheel calculator. I let the puncture bleed for a while, disinfected it well, tried to recall when I had my last tetanus shot (recently enough), and grumpily proceeded to complete the reassembly of the "machine that bit me", with a rather painful right index finger. In conclusion, it pays to be careful, and at least look first at where you're putting your fingers. Wearing safety glasses is also a good idea when working with tiny things that tend to go "sproing". 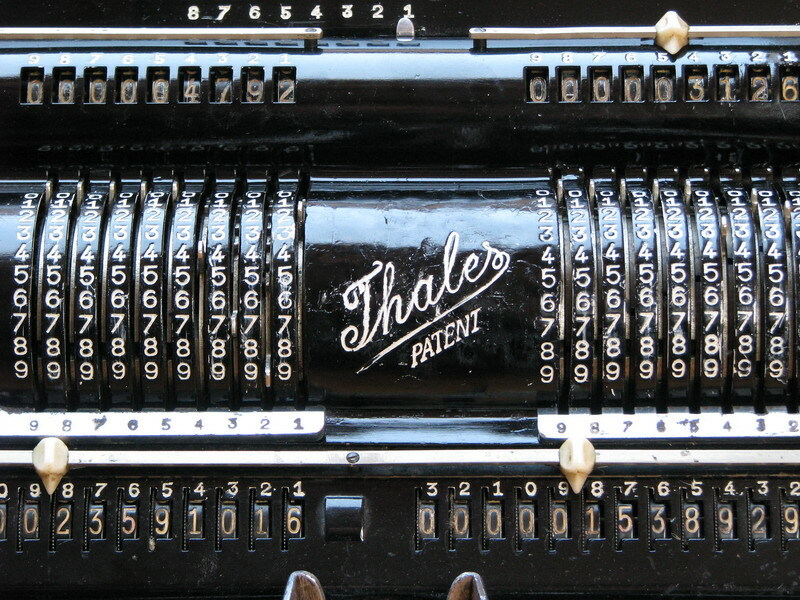 On functionality, the same thing counts for the Thales GEO as for the Brunsviga 183 - the carriage can move its right register under the left machine, and vice versa, in order to switch x and y. 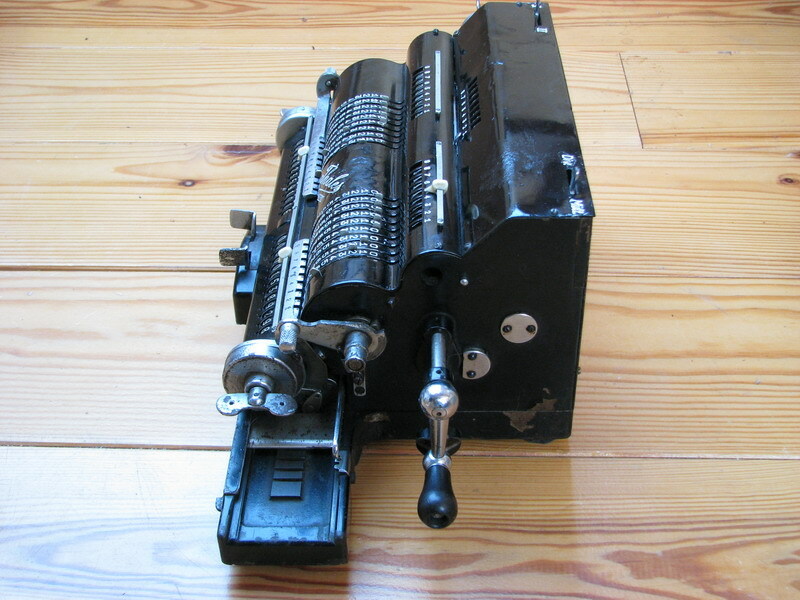 But because the other register then sits idle, you need to crank in the relevant factor twice, which is precisely why the Brunsviga 183 saves so much time. Update: the machine broke again, in a spot which I didn't even see was repaired until now, while timing calculations for the page on double and triple calculators and coordinate calculations. 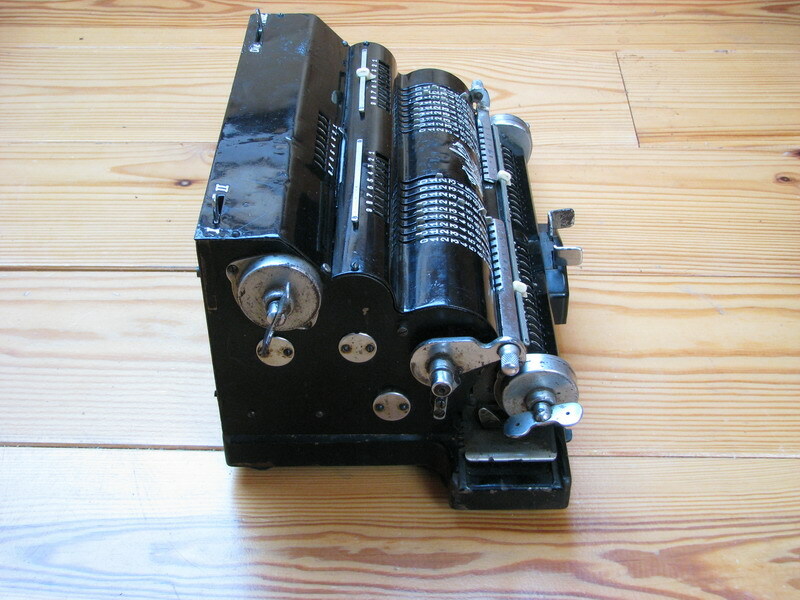 The finger that operates the setting lever lock in the right pinwheel cylinder had been crudely soldered together and whereas it had been working fine until now, unfortunately no longer. It cracked and bent, and had to be resoldered. Before selling the machine, I managed to do just that, and luckily without having to disassemble the entire machine to get at it, whcih, frankly, was a lucky escape, it was not something I was looking forward to doing!